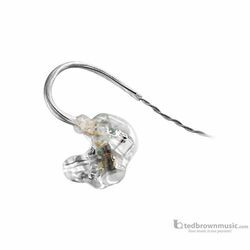 When you need a critical mix but can’t be isolated from the audience or band members, consider an open in-ear solution. The UE 1 PRO is a single earpiece that delivers the right and left channels to one ear. The single monitor solution makes it possible to get a detailed mix for harmonies while maintaining a connection with the audience and the venue. Both the right and left channels are delivered to a single ear. There are a total of 4 drivers; 2 for the right channel and 2 for the left. This unique design has a 2-way crossover for each set of balanced armatures. The channels are separated even in the sound tubes.